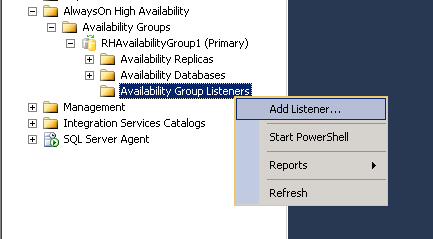 This post primarily concentrates on setting up the listener for a SQL Server Availability Group in AWS in a multi-subnet cluster. Just a warning, the listener does not function in AWS as you would expect on local instances. Don’t assume this article solves listener issues. It does not. I’ll outline what the issues are with the listener in a later post. 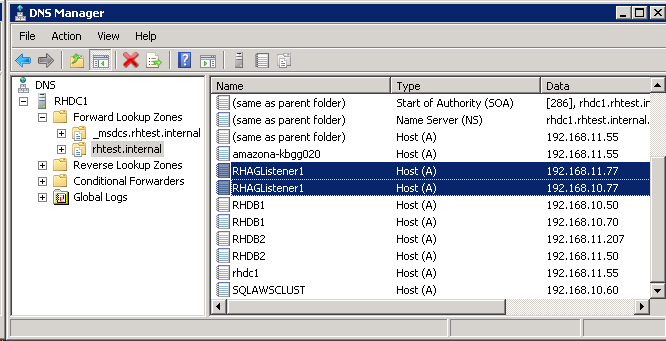 Installed Sql Server 2012 on a couple of EC2 instances located in different subnets. Created a few test databases (and done full backups) on one of said database EC2 instances. Created an availability group hosting said databases. Before I begin, a shout out is deserved to Jeremiah Peschka (blog | twitter), as I’d never have gotten this figured without this post. Enter in the Listener DNS Name, enter in the port (I left the default port of 1433 for this demonstration to keep it simple), and select StaticIP for the Network Mode. The Windows Server Failover Clustering (WSFC) resource control API returned error code 5057. The WSFC service may not be running or may not be accessible in its current state, or the specified arguments are invalid. For information about this error code, see "System Error Codes" in the Windows Development documentation. The attempt to create the network name and IP address for the listener failed. The WSFC service may not be running or may be inaccessible in its current state, or the values provided for the network name and IP address may be incorrect. Check the state of the WSFC cluster and validate the network name and IP address with the network administrator. You’ll want to create new IP addresses for your listener that are not being used by the failover cluster itself. The IP addresses will be added to DNS automatically, as will be illustrated further down in the post. For example, currently on my servers I have addresses of 192.168.10.70 & 192.168.10.50 for one node, and 192.168.11.70 & 192.168.11.50 for the second node. For my IP addresses for the listener, I will add IP addresses of 192.168.10.77 & 192.168.11.77. Obviously, you have to run this as an account that has the proper permissions to add entries to DNS. In my case, I had god rights. You’ll probably want to be a bit more restrictive. Next, if you look in your DNS, you’ll see it added the listener name with both IP’s. Next, go to your AWS console. 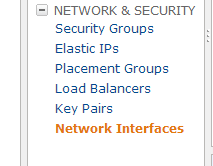 In the console under your EC2 Dashboard under Network & Security, click the Network Interfaces. 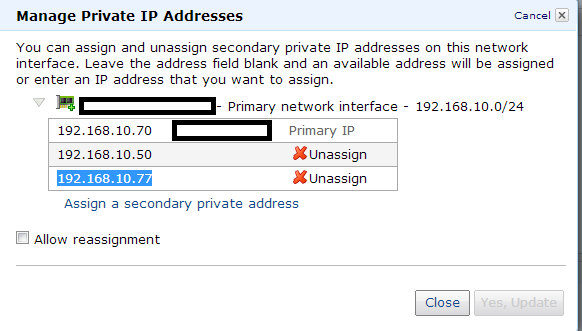 Select the network interface that is associated with your AMI and click Manage Private IP Addresses. Your listener should now be ready for testing. This is where the fun really begins. I’ll split the testing out to another post, as this one is getting pretty big. Just wanted to let you know that this came in handy (again). From all the guides I’ve read in regards to AlwaysOn in AWS, they missed out a very important step which was to add the IP’s to the Network Interface. Thank you spent 2 days troubleshooting. In my case I already have 3 IPs for each node and each eNI associated with EC2 has similar IPs. I was still getting this error. I can try making a DNS entry if this solves the problem. Are able to solve the issue? I am also using the same setup. How do you create the listener?